Can you believe we’re more than halfway through September? It seems like just yesterday that we celebrated the start of the National Crafts & Cowboy Festival, and now there’s only a little more than a month left to visit what Travel & Leisure named The Best Fall Festival in Missouri. The event, presented by Humana®, continues Wednesdays-Sundays through Oct. 27, but one of our favorite features goes away at the end of September. The Cherokee Indian Trading Post, new for 2018, features a trio of Native American artisans demonstrating traditional crafts that are staples of their culture and heritage. Each of them are Cherokee National Treasures, a prestigious honor bestowed upon those with an outstanding knowledge of the Cherokee culture and arts. 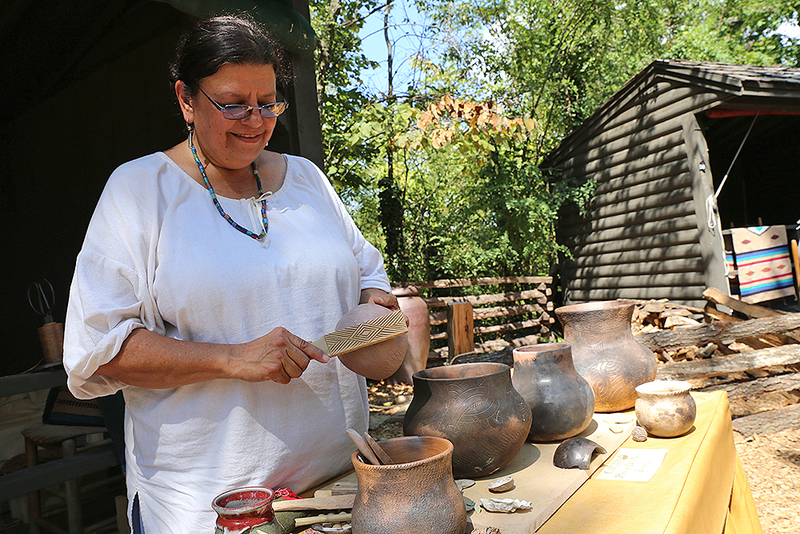 You can witness these talented artists craft flutes, bows and pottery while learning about how each item related to the proud Cherokee legacy. Here’s a little bit of information about the artists you might encounter during your visit. Remember: The Trading Post will go away for the year on Sept. 30, so make plans to visit soon! Lisa Rutherford is skilled with several different mediums, but during the National Crafts & Cowboy Festival she is focusing on one that has been part of the Cherokee culture for centuries. She’s demonstrating the methods Cherokees used to create pottery, a vital part of everyday life. Cherokees would create large clay pots to store their harvests, while smaller pots shielded seeds from pests. The pottery was also used for other purposes, like carrying water and cooking food. While pottery was important for survival, it also featured an artistic element. Cherokees often finished the pots with wood paddles. Artists would carve designs into the wood and then apply them to the wet clay, creating a design that stuck with the pot once it was fired. Rutherford has some of these paddles on her table and uses them to illustrate the process. “We’re educating, but we’re also entertaining,” she said. Silver Dollar City is the latest stop on Tommy Wildcat’s journey around the world. 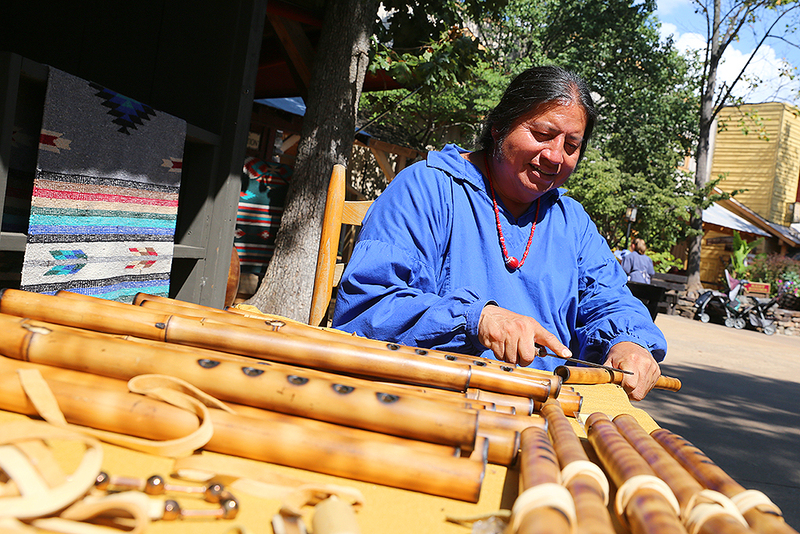 A former winner of the Native American Music Award for Flutist of the Year, Wildcat has been crafting flutes and blowguns for more than 25 years. He’s performed on four European tours, a variety of historic sites and at the National Museum of the American Indian in Washington, D.C.
Wildcat grew up wanting to see the world, and he can’t think of a better way to do that than by using his music to promote and preserve the Cherokee culture. He crafts flutes from river cane, a form of bamboo that is indigenous to North America. He’ll burn several holes in the cane, then shave them down with a file to help fine-tune the notes. He said these types of river cane flutes go back thousands of years, but the music he creates with them is much newer. Rather than traditional Cherokee songs, most of which were lost to history, he plays original compositions with titles that are important parts of the Cherokee language. You might hear him perform “Donadagohuhi,” meaning “I’ll see you again,” and “Osda,” meaning “good” or “fine.” He said only about 4,000 people currently know how to speak the Cherokee language, a fraction of the population able to use it to converse 100 years ago. If he can teach a few listeners some important words, he’ll help ensure the language lives on. “I’m very honored to be a part of the beautiful world of promoting my heritage, Wildcat says. While many of the people who watch Richard Fields demonstrate are learning about Cherokee bowmaking or cooking for the first time, he’s had a lifetime to perfect the techniques. He grew up in the Cherokee Nation in eastern Oklahoma, learning “the old ways” from family. Today, Fields loves to share his knowledge of the Cherokee language and culture. He’s been making bows for over 30 years, carrying on a tradition that goes back as far as he can remember. On other days, you can see him cook Cherokee dishes like grape dumplings, Kanuchi and fry bread. “It’s traditional food that we’ve always had,” Fields said. Be sure to check the daily show schedule to learn more about what Fields will be demonstrating on the date of your visit. Don’t forget: Everyone can experience the Cherokee Indian Trading Post and everything Silver Dollar City has to offer for the kids’ price of just $54 plus tax through Sept. 30. This limited-time offer is only available online, so book your tickets today and visit any operating day this month!